I started day 57 from Wimberley Texas in a light drizzle and fog. Apparently the motorists driving into Austin for work must cut in close for time. The local sheriff’s department said they received 4 calls about a guy riding a unicycle holding up traffic. I just hope they weren’t using their cell phones while they were driving, and I hope they weren’t dialing 911 because I held them up for a few seconds on a hill or curve. I’m pretty sure the sheriff deputy was expecting something completely different when she found me. She explained the road was hilly and curving and motorists get into accidents trying to pass. She wanted to know where I was headed hoping I would be off the road soon. I told here I had been riding from San Diego and was headed to St Augustine Florida by way of Kyle. She advised just to stay as far right as I could. I figured it was only a matter of time when some official would question what I was doing. I was surprised it took this long in the trip. Several miles latter a motorists was on the side of the road taking pictures. When I passed he drove by again taking pictures while he drove by. Then he stopped up ahead again to take some more pictures. When I came upon him this time I had just pulled a hill in low gear so I was going a bit slower. He asked if I would pull over for a minute. It turns out he is a freelance photographer taking pictures for some Austin news paper. I gave him my info and pedaled on. 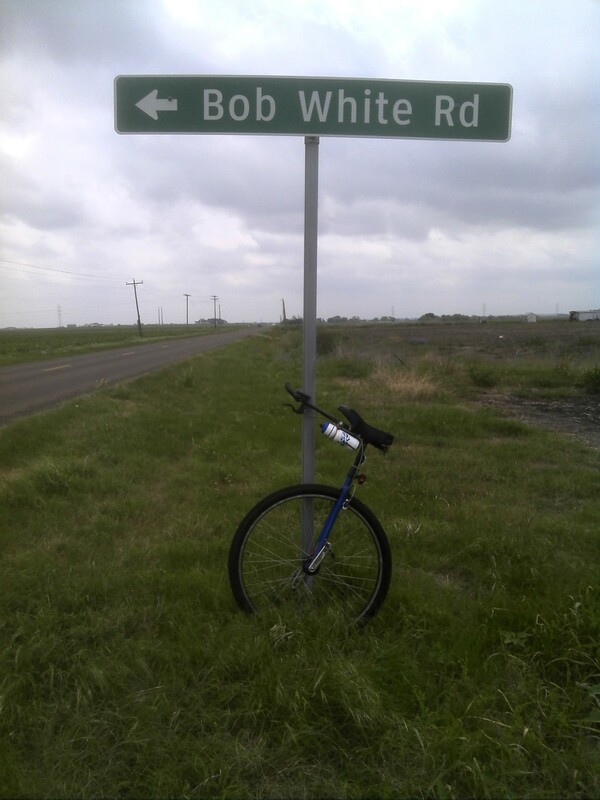 A few miles out of Kyle Texas the terrain flattened out and I had hopes of making some serious miles. I was headed southeast and the predicted southeast winds had been lying in wait for me until I cleared the hills. Back to bucking headwinds in low gear. I came across a road I couldn’t pass up. I caught a little break leaving Lockhart heading a bit North East and managed to pick up the pace a little. Stats for Day 57: Rode 41.00 miles at 11.1 mph, Max=16.3 mph, Ascent=1093′, Descent=1467′, Max elevation=1125′, Min elevation=467′, Ave heart rate=122, Max heart rate=165, Lest you think I was loafing by only riding 41 miles today Garmin begs to differ giving me credit for 1402 calories burned. Speechless at the road sign. Stay safe. has to be a “shun pike” road! what do you expect from a town that sells t-shirts that say “keep austin weird”? that was some very helpful advise that barnita fife gave you. I know when I share the road with motor vehicles I just flip a coin, heads-stay to the side, tails- ride down the middle. ummm… you didn’t mention your blog to the deputy did you? keep going good luck on your trip you’ll find out about ours when we ride in the parade this weekend. I LOVE the sign! .Made me feel like it was a “sign” from Uncle Bob and how he’s watching down on you, keeping you safe, and how proud of you he is!